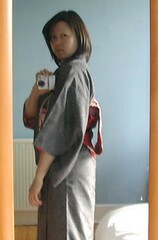 Tried on my gray tsumugi kimono with a red Yuzen nagoya obi. Still can’t get the hang of the taiko musubi; it looks rubbish from the front, back and sides. Am also starting to regret not checking sleeve lengths before buying juban/kimono on ebay. The juban sleeves stick out, and I gather that is a no-no. Not being Japanese, I found several websites extremely useful for the eleborate process of putting a kimono on, the most useful of which has been kimono.fraise.net. There are extraordinarily clear directions on kitsuke (the technique of wearing a kimono), and brill links to other sites that have photographed step-by-step directions, like Somesho and Tomasan’s kimono school (both of which can be easily translated using nifty or babelfish). Another site I’ve found very useful is Japan Culture Club’s Kimono FAQ, which has photos of the accessories needed for kimono wear, and instructions in English for putting on a tsukesage, and tying a simple obi bow.